Already this year I have had several early morning sorties to a spot I had never fished before. It looks (to me) to be a perfect place to intercept the fish returning from their winter quarters in the south west approaches. I have known for many years that the returning shoals stop off at suitable headlands to feed on young-of-the-year sand eels. The trick is to be there at the same time as the fish. This season I started early (in late March) and had a weekly short session (an hour or so) plugging and popping at my 'new' spot. Since late March there had been nothing doing. On a few occasions I had seen the sandwich terns, which like the bass feed on sand eels, flying over the race and looking down hopefully but there was no action for either me or the birds. To fish my spot I have to wade, often chest deep, across a deep gully and then perch on the end of a rocky ledge where the tide roars past my booted feet. The lures can be cast into and across the fast flow and allowed to swing over the clutching fronds of kelp, just beneath the surface. Occasionally my heart leaps as the plug contacts a leathery frond and momentarily stops vibrating but, until this week - zip!!! The sun was just coming up as I slid down into the gully and waded across to the rugged, barnacle covered ledge. The tide was already half way out and running hard to the west. I laid my bag on the rocks, well clear of the splashing waves, checked the points of the hooks on my plug for sharpness and flicked the lure out into the flow. The rod top shuddered to the wriggling lure and I simply held the line clear of the water without reeling so that it could swing in an arc over the top of the weed. It reached the slacker water inside the race and I retrieved it steadily so I could still feel the plug working. I lifted the lure from the water and cast again, this time shorter to cover different water on the swing round. Just as the lure left the turbulence wallop! The rod was yanked over and line dragged off the reel against the clutch. The fish wallowed and splashed in the kelp and then bored off into the fast water. Four or five times I dragged it back into the eddy and each time it powered across the flow. I need not have worried. When the bass was landed one of the Eagle Claw hooks was firmly in the tough scissors. I unhooked the bass, weighed it at 2.5 kilo (five-and-a-half-pounds but it really is time I stopped using pounds and ounces) and slid it back into the sea. Ten minutes later I had another take but failed to hook it. The kelp was now showing above the surface so I packed in and went home. The following morning I had another go but the wind had changed and it was much rougher and colder. I had only one bite well out in the race itself. The fish kicked and struggled for a few seconds and then came off. Ah well! Next time! 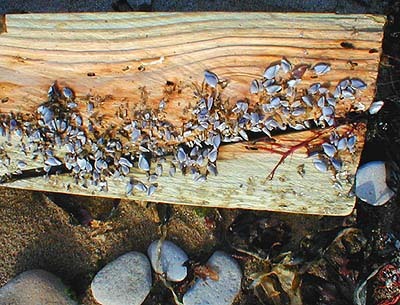 On the way back along the shore I found a piece of timber covered in half-grown goose barnacles. Weird little creatures which spend their lives drifting round the ocean on bits of flotsam. Even when I catch nothing there is generally something of interest to see. The eddy on the edge of the race. At last - my hopes were confirmed! The fish was well hooked in the scissors. 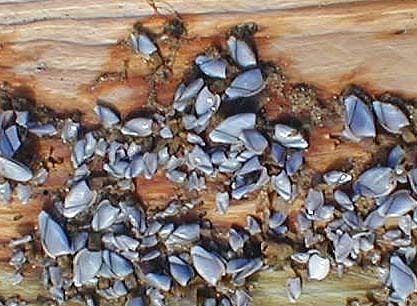 Goose barnacles on a timber offcut.